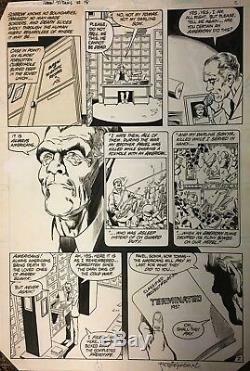 The New Teen Titans #18 p. 2 is a beautiful page penciled by the great George Perez and inked by Romeo Tanghal featuring a bitter old man (Marek Slavik) planning an act of revenge against all Americans. This original was touched by a remarkable artist and there's only one in existence. George announces his retirement from doing contractural comics job and lessening his appearances in ComicConvention and soon there will be no more of this kind around. The item "Comic Art OriginalThe New Teen Titans#18 p. 2-George Perez&Romeo Tanghal" is in sale since Wednesday, January 23, 2019. This item is in the category "Collectibles\Comics\Original Comic Art\Interior Pages". The seller is "rome-tangh" and is located in Somerset, New Jersey. This item can be shipped to United States, Canada, United Kingdom, Denmark, Romania, Slovakia, Bulgaria, Czech republic, Finland, Hungary, Latvia, Lithuania, Malta, Estonia, Australia, Greece, Portugal, Cyprus, Slovenia, Japan, China, Sweden, South Korea, Indonesia, Taiwan, South africa, Thailand, Belgium, France, Hong Kong, Ireland, Netherlands, Poland, Spain, Italy, Germany, Austria, Bahamas, Israel, Mexico, New Zealand, Singapore, Switzerland, Norway, Saudi arabia, Ukraine, United arab emirates, Qatar, Kuwait, Bahrain, Croatia, Malaysia, Brazil, Chile, Colombia, Costa rica, Panama, Trinidad and tobago, Guatemala, El salvador, Honduras, Jamaica, Viet nam.